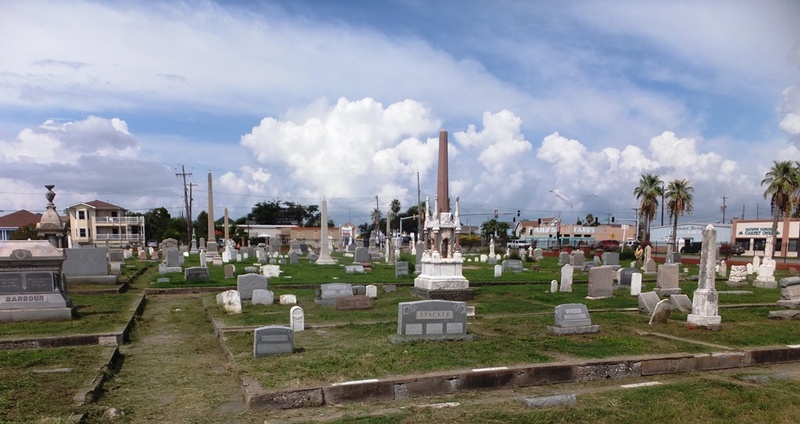 The Broadway Cemetery Historic District is comprised of seven burial grounds plotted between 1839 and 1939. The Old City Cemetery (1839) has paved walkways and concrete curbs. Monuments range from simple stone (granite and marble) to tall obelisks and seven large above ground vaults. Approximately 1,500 souls are interred in it. The Potter’s Field (1839) and Oleander Cemetery (1939) contain a wide variety of monuments. (A potter’s field is where indigents are buried.) Only a few gravestones are here. Most burials were unmarked. The City of Galveston platted and landscaped Oleander. Records show about 1,000 interments took place in these sections. 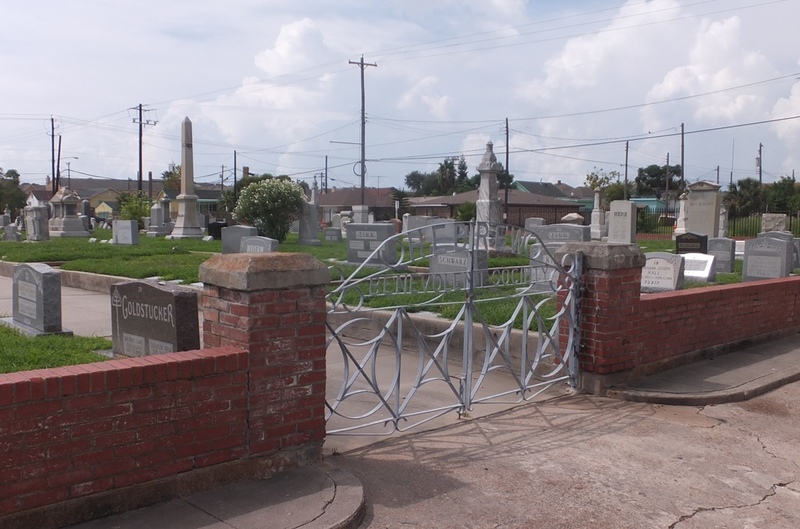 New Cahill Cemetery (@1900) and Evergreen Cemetery (1923) have a large fence and concrete curbs outlining this plot. It was initially to memorialize a number of persons who perished in the Great Storm of 1900. It contains about 900 burials. Episcopal Cemetery (1844) is associated with Trinity Episcopal Church. It has a brick wall and concrete walkways. Five large above ground vaults are located here. During the grade raising of 1904-1910 many of the monuments and vaults were elevated although the graves were undisturbed. More than 1,000 persons are buried here. 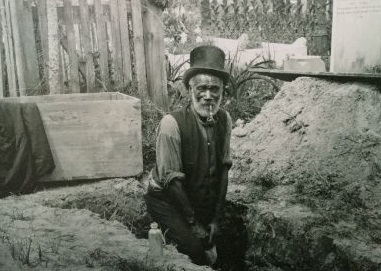 For many years a famous Galvestonian, “Uncle” Newton Taylor (1828-1905), worked for the church digging graves and as an organ blower. He was easily recognized by his black silk top hat under which he carried his fried chicken lunch to work. 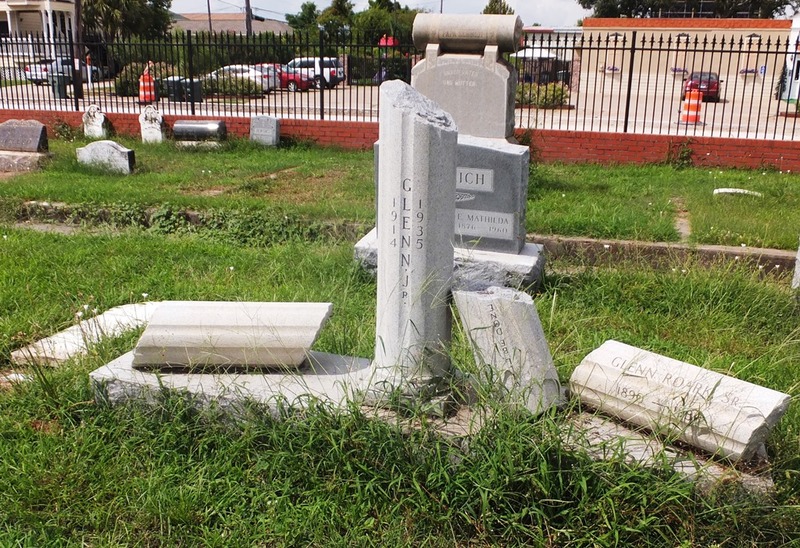 Old Catholic Cemetery (@1844) was the responsibility of the Diocese of Galveston. It has two concrete walks that are labeled with small white tiles. One of these leads to a Doric columned outdoor chapel. Approximately 900 souls lie at rest here. Old Cahill/Yellow Fever Cemetery (@1867) and New City Cemetery (@1900) have concrete walks and curbs. The latter burial ground was used for victims of the previously mentioned 1900 Hurricane. An estimated 650 graves are in this section. The Jewish section, the Hebrew Benevolent Society Cemetery (@1868), contains a large central concrete walkway as well as several smaller curbed sidewalks. It also has a brick wall with an arched metallic gate that says “Hebrew Benevolent Society Cemetery.” About 500 people are interred here. There are two small buildings, in poor condition, on the property. Both are sexton’s offices. If you visit this cemetery look for the various architectural styles such as Greek, Italian and Renaissance. Broadway is filled with religious symbolism on the thousands of tombstones. Keep an eye out for cloaked and broken obelisks, crosses, cherubs, lambs, Sacred Heart, Mary, lilies, angels, wreaths and willow trees. If you want to know more about these funerary symbols, please go to our post: Cemetery Iconography and Symbols. 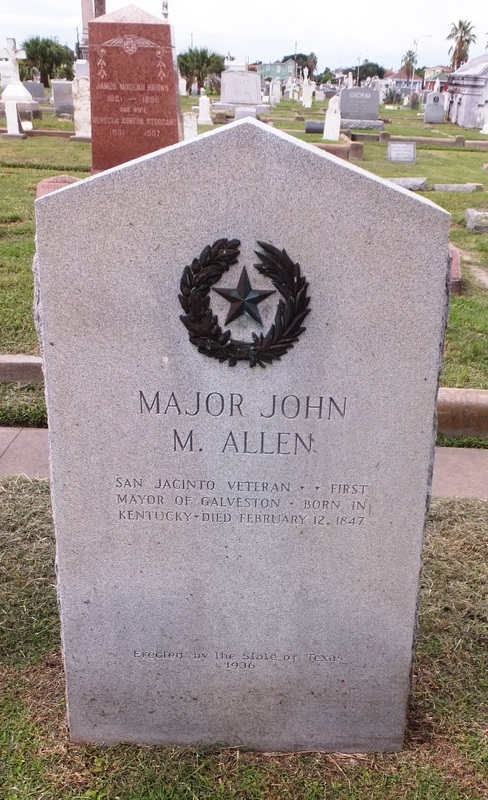 Allen, John M. (? – 1847) – Galveston’s First Mayor – Allen was born in Kentucky and came to Texas in 1830. He was captured in the Tampico Expedition (a battle that preceded the fight for Texas’ independence from Mexico) but escaped execution. Upon his return to Texas, he saw action at the Battle of San Jacinto. 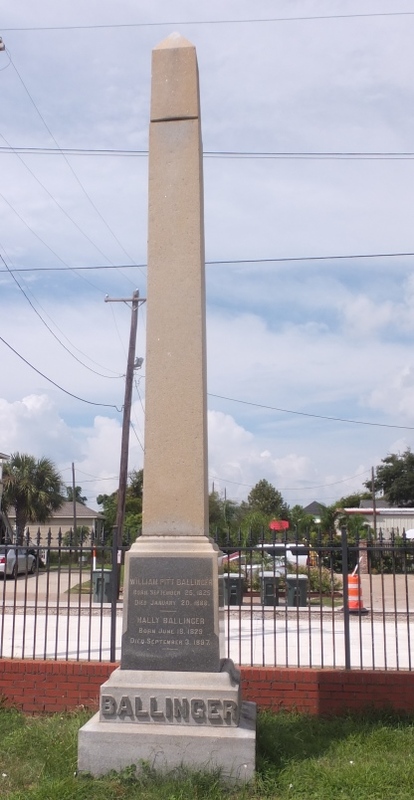 Eventually he moved to Galveston and was elected mayor in 1839. 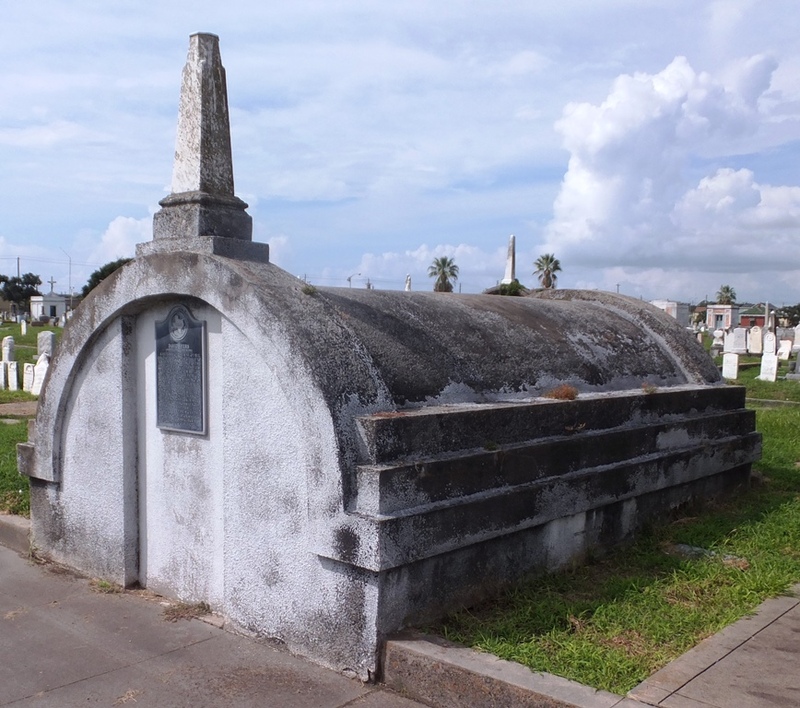 In a dust-up with Samuel May Williams and Thomas F. McKinney who were attempting to sell shares of the Galveston City Company that could be redeemed for land or resold, Allen moved city archives to his own home, protecting the charters with cannons. The district court ruled in Allen’s favor and he was re-elected as mayor annually until 1846. After Texas joined the United States (1845), he was appointed marshal for the Eastern District of Texas until his death in 1847. 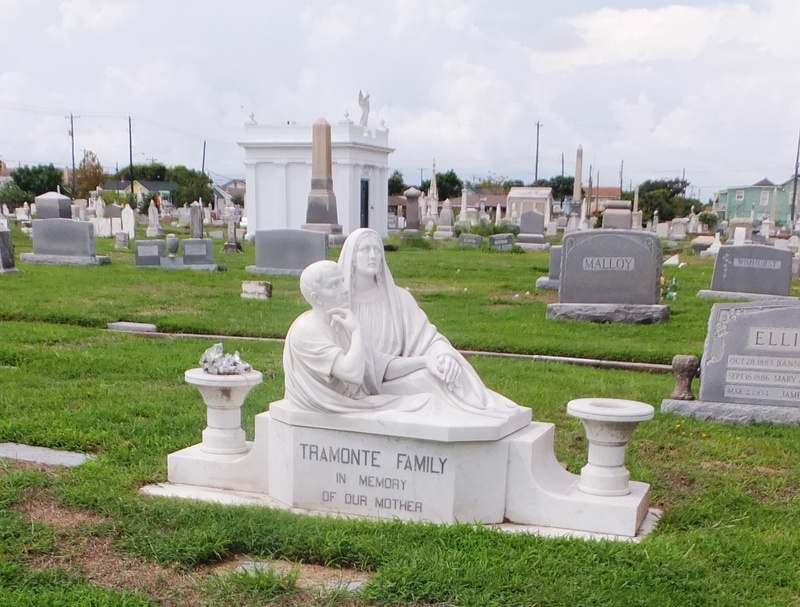 His funeral is reported to be one of the largest in Galveston’s history but his grave is unknown. His life is commemorated with a historical marker. Ayres, David (1793-1881) – Merchant and Founder of the First Methodist Missionary Society in Texas – Born in New Jersey, Ayres and his wife came to Texas in 1832. They bought a tract of land west of Washington-on-the Brazos and built a stone home he called Montville. In 1834, upon returning from a trip back East, Ayres distributed what is believed to be the first Bibles brought to Texas. Along with his mercantile business, Ayres established a school in his home. William B. Travis (who was to become commander at the Alamo in the following year) brought his son Charles to attend the school. He lived with the Ayres family for two years after the fall of the Alamo. During the war with Mexico, a hearing problem prevented Ayres from active participation but Sam Houston asked him to protect families fleeing in the Runaway Scrape (an 1836 evacuation by Texas families taking flight from Santa Anna’s army). After Santa Anna’s surrender, Ayres found his property in ruins but soon recovered financially and moved to Austin County where he led Sunday services and prayer meetings. In 1837 he teamed up with the superintendent of Methodist missionary work in Texas and formed the first Missionary Society in Texas. He was elected secretary. In 1847, he moved his family to Galveston, re-established his mercantile business and served as US deputy marshal. He published the Texas Christian Advocate and wrote some of the earliest records on Methodism in Texas. He was instrumental in the building of St. James Methodist Church in Galveston. 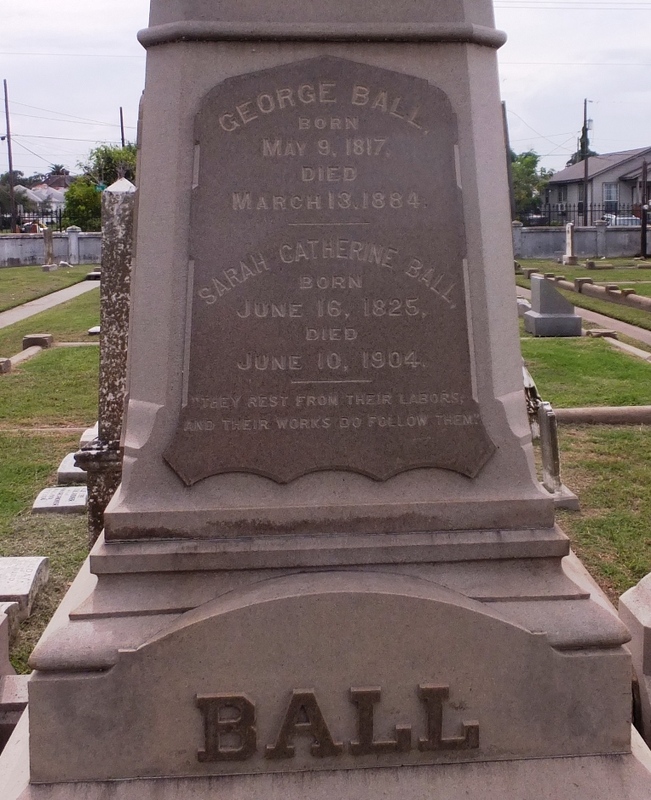 Ball, George (1817-1884) – Banker ­- Reared in New York and trained for business, Ball arrived in Texas in 1839 and opened a department store with his brother, Albert. In 1847, he became director of the first incorporated bank in Texas, and in 1854, opened the Ball, Hutchins and Company banking business (the building still stands on Strand Street in downtown Galveston). During the Civil War, he aided the Confederates by shipping goods through Mexico. Following the war, he re-established his banking business and invested in a steamship line. He was a generous philanthropist, supporting hospitals and schools but kept his contributions private. Ball High School in Galveston is named in his honor. Ballinger, William Pitt (1825-1888) – Attorney – Ballinger arrived in Galveston in 1843 and received his law license in 1847. He served as a US district attorney from 1850 to 1854. He declined appointments to the Texas Supreme Court in 1871 and 1874 but participated in the Constitutional Convention of 1875 as a member of the Judicial Committee. He declined the Democratic nomination for governor in 1878. His daughter, Betty, was one of the organizers of the Daughters of the Republic of Texas. The county seat in Runnels County (in the heart of Texas) is named in his honor. 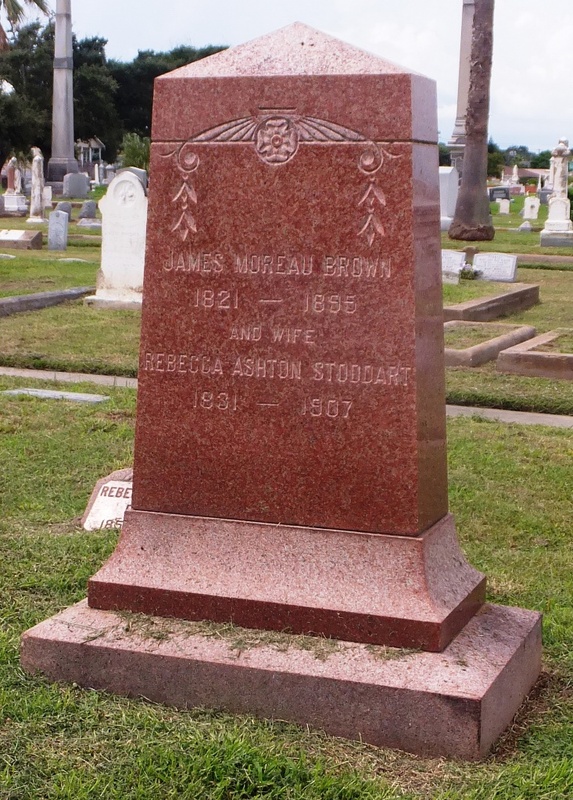 Brown, James Moreau (1821-1895) – Businessman, Alderman and sometimes Architect – From driving a boat along the Erie Canal to brick mason, plasterer and architect, Brown was one of the wealthiest men in Texas in the 1870’s. It is said he influenced the first brick jail and the old Galveston marketplace and built the first brick house – Ashton Villa (available for guided tours). 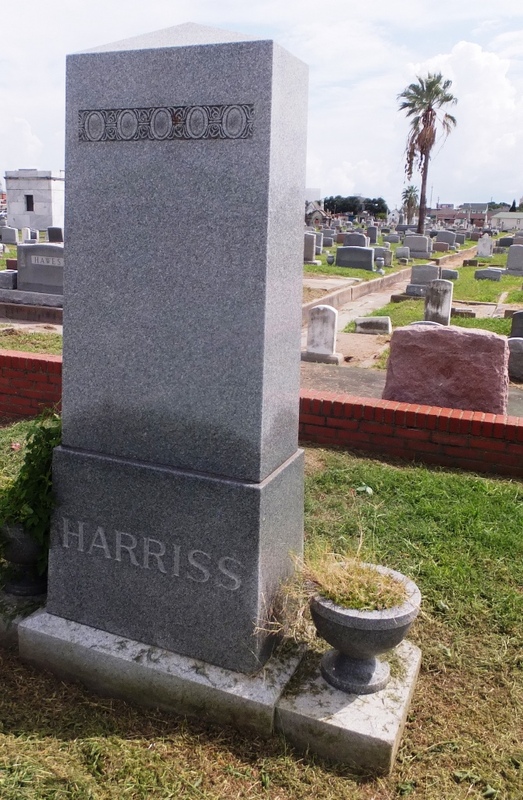 He was appointed to the Galveston board of aldermen, served as director and president of the First National Bank and the Galveston Wharf Company, director of the Union & Marine Fire Insurance Company and board president of the Life Association of America. 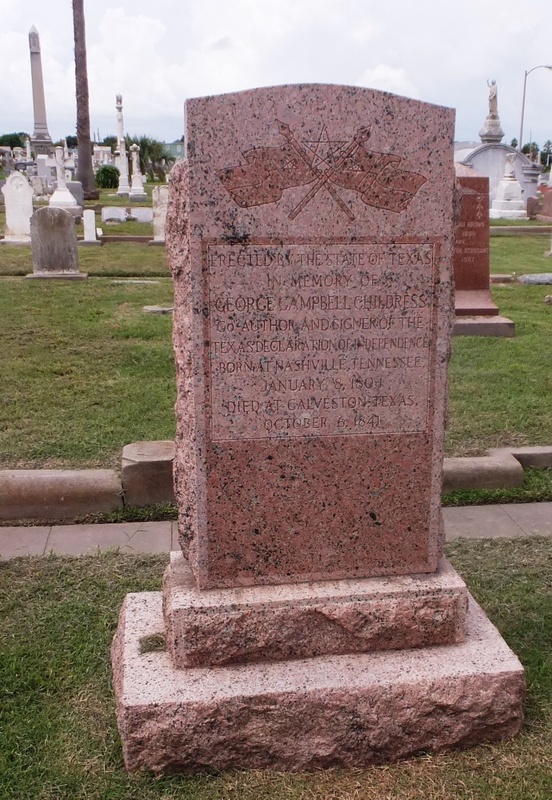 He was president of the Galveston, Houston and Henderson Railroad and was an original member of the first volunteer fire brigade. He promoted gas and electricity development and chaired the construction of the city waterworks. In partnership with his son, he built one of the largest hardware businesses in the South. Childress, George Campbell (1804-1841) – Lawyer, Statesman and Author of the Texas Declaration of Independence – Childress traveled from his home state of Tennessee to join his uncle, Sterling C. Robertson in 1835. Robertson was establishing a colony on the Texas Red River. The following February, Childress and his uncle were elected to the Convention of 1836, a meeting of delegates to determine the course of Texas’ independence from Mexico. Childress introduced a resolution authorizing a committee to draft a declaration of independence. When that resolution passed, Childress was then selected as the committee chair. He is credited with being the primary author of the declaration. Later that year, Childress was among the group sent as diplomatic agents to negotiate with President Andrew Jackson for recognition of Texas as a Republic. In the years following, Childress attempted to establish a law practice in both Houston and Galveston but they were not successful enough to support his family. He committed suicide in 1841 but his efforts as statesman were recognized with Childress County named in his honor. Durst, John Marie (1797-1851) – Merchant and Patriot – Durst came to Texas in 1806 and lived with his godfather following the death of his dad. P. Samuel Davenport was a prominent merchant in Nacogdoches and taught Durst the mercantile business and to speak Spanish and Cherokee. Upon Davenport’s death, he bequeathed 10,000 acres in western Louisiana to Durst. Five years later, Durst and Davenport’s son negotiated a land exchange where Durst acquired all property west of the Sabine River and the son all lands to the east. Sometime later, Durst received a Mexican land grant in Houston, Nacogdoches and Anderson counties. By 1837, the tax roll listed Durst as the owner of 36,200 acres in Texas. By the late 1820’s, Durst had become active in statewide politics, particularly because of his skills in Spanish, French, German and a number of Indian languages. While serving as a Texas representative in the Mexican legislature, he learned of Santa Anna’s intention to move troops into Texas and rode some 960 miles to warn the people of Texas. 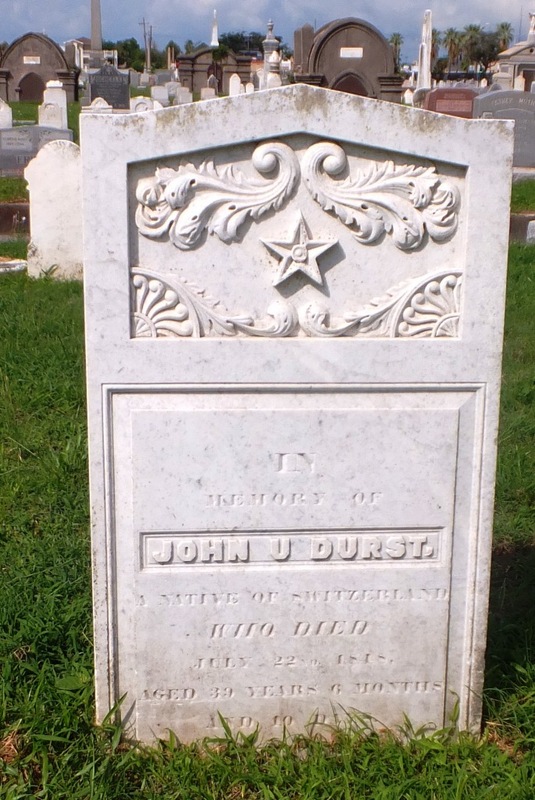 He was very active during the fight for Texas independence from Mexico. Durst died while attending a session of the Texas Supreme Court in Galveston. Fisher, William S. (? – 1845) – Soldier and Secretary of War of Texas – Fisher came to Texas in 1834 and almost immediately became involved with the Texas army and the struggle for independence. His company reinforced Sam Houston’s army and participated in the Battle of San Jacinto (where the Texians (sic) were victorious). He served for a short time as Secretary of War, then led the Mier Expedition, one of a number of border skirmishes with Mexico that is notorious in Texas history. Tricked several times by the Mexican leaders, the Mier soldiers were eventually captured and subjected to what is known as the Black Bean Episode – beans were drawn from a jar. Those who selected black beans were executed. The remaining, one of whom was Fisher, were imprisoned in Mexico City but eventually released. 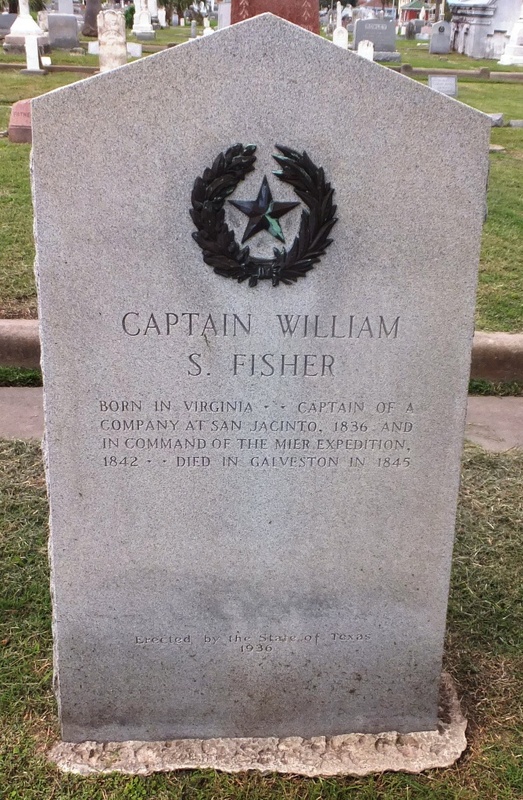 Fisher returned to Texas where he died in 1845. Fowler, Charles (1824-1891) – Railway Man – The railroads changed the way of life in Texas. River travel was possible but most Texas rivers were not deep enough or dependable year-round. Roads were virtually non-existent and where they did occur, they were impassible in wet weather. Although somewhat controversial due to banking and monopoly clauses in their charters, railroads made the development of Texas possible. 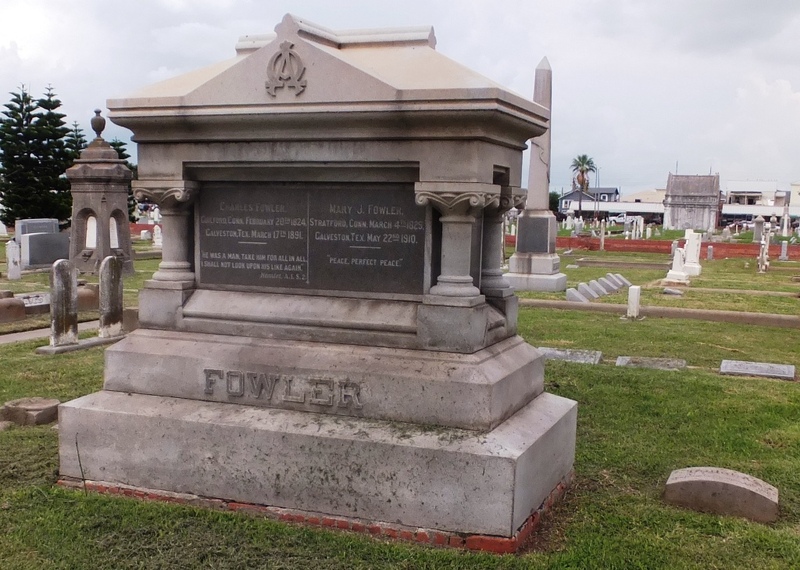 Charles Fowler served as a director of several of the first railway charter companies – the Texas Central Railway Company, ultimately linking Texas to Colorado; Morgan’s Louisiana Railroad and Steamship Company which had a shipping monopoly from New Orleans and Galveston following the Civil War; and the Galveston Terminal Railway.